Microsoft’s annual Imagine Cup, a global competition of high-tech student projects, reached its culmination this week accompanied by the usual pomp at the company’s headquarters in Redmond. The winner of the $100,000 grand prize and 365 days of bragging rights is X.GLU, a Czech team that created a custom smart glucose meter for children with diabetes. The device is thinner than any glucose meter available now, has no buttons or interface to fiddle with, and can be customized like a smartphone with colored or printed cases. It’s controlled entirely from a smartphone app, and powered by an NFC connection — the disposable blood analysis strip doesn’t actually need any power, so only a little is used to transmit the small amount of data it produces. Marek Novak, the 22-year-old hardware designer for the team, made it all using off-the-shelf parts to keep prices down. 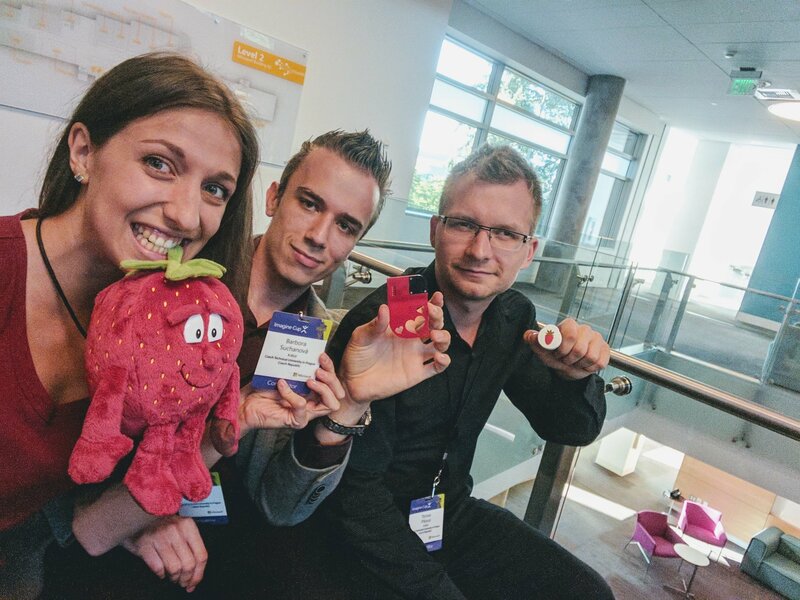 The other team members, Tomas Pikous and Barbora Suchanova, put together the cloud-based infrastructure that allows caregivers or emergency contacts to see the kid’s glucose levels or get alerts if, say, the kid doesn’t test on time. In addition to the $100,000, the team gets a one on one mentoring session with CEO Satya Nadella, $125,000 in credit on Azure services and tickets to next year’s Build conference. Congrats to X.GLU for an innovative project taking on a serious problem. Second place went to Oculogx, which created a warehouse navigation app for HoloLens — sounds kind of dry, but it’s pretty neat. It overlays directions and highlights items for human “pickers,” increasing their efficiency and reducing errors. One wonders how long such a technology would be applicable, however, considering the advance of robots in the warehouse labor space. Third was ResCue, which equips drones with computer vision and navigation modules that let them be easily deployed to disaster areas, where they can perform zone searches for people who need help. And fourth was NeuroGate, which uses Kinect to do gait analysis, for diagnosis or monitoring of neurodegenerative diseases. The Imagine Cup is always a pleasure to cover, since the young creators involved haven’t yet developed that thick shell of cynicism and pragmatism that plagues so many startups. You can read more about the (many) other teams that competed over at the competition’s microsite.